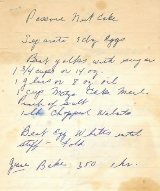 A handwritten recipe from Sarina's mother Renee. The inspiration for Sarina’s Sephardic Cuisine came from the priority for food preparation and entertaining conveyed to Sarina from Esther Cohen Salem, her grandmother, and Renee Salem Missry, her mother. In 1920, Esther and her two younger brothers, Sam, 13, and Joe, 11, came to America from Beirut sharing a passport issued by the French Troops of the Levant. Selim Salem came the same year, obtaining a job as a waiter in the Egyptian Rose restaurant, which was owned by Esther’s older sister Rose Cohen Misrie. Esther and Selim married in 1923 and had eight children. Esther was not educated and had never been to school when she arrived at Ellis Island. Not even able to write her own name, she relied on her cooking and sewing ability. A natural cook, Esther never measured, but rather used touch, taste and feel as her guide. 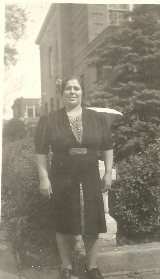 Esther and Selim were the first to own a Syrian catering service in the Syrian Jewish community in Bensonhurst, Brooklyn. They built a kitchen in the backyard garage of their Bensonhurst home on 63rd Street. Their basement was converted into a storage area for gallons of pickles and imported Syrian spices. The backyard kitchen became the center of life for the entire the Syrian community. Esther’s kibbe and pastry were famous. Members of the Sephardic community would trek up the narrow side alley to her backyard kitchen, especially in preparation for holidays and special events, to purchase her goodies. The smells would emanate from the kitchen and greet you like a breath of fresh air. Before the advent of catering halls, most Syrian Jews entertained in their homes and wanted foods familiar to them for life cycle events. Esther and Selim catered brit milahs, engagement parties, sebets, weddings, bar mitzvahs and life cycle events from the 1940s until the late 1960s. The community relied heavily on Esther for its supply of the food of their culture. As children, all of Esther’s grandchildren can tell you of the times they sat in Esther’s kitchen, trying to make kibbe or sambusak, or some other Syrian recipe. The children would struggle with one small piece of dough as Esther shaped hundreds, her efficient hands working faster than a machine. As the second daughter of Esther’s eldest child Renee, Sarina learned from them, as did her sisters. Over the years, the ingredients were measured and the directions carefully written down, so that the granddaughters could convey this rich heritage of food to their children for generations to come. Sarina and her sisters took pains time to learn as many things as they could about their mother and grandmother’s cooking, learning their secrets, their tricks, and the subtleties of Syrian cooking that make the difference between a good cook and a great chef. 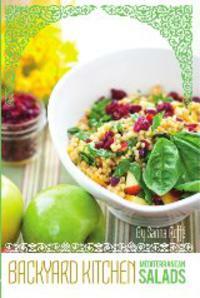 The result is Sarina’s Sephardic Cuisine! Enjoy!